Cover photograph: ‘Story Time’ © Heide Smith, 1996. This guide provides a summary of the major themes, findings and recommendations of the National Inquiry into the Separation of Aboriginal and Torres Strait Islander Children from Their Families. Quotes in this guide appear in italics. However all references can be found in the full report where details of the witness or author are provided. Indigenous children have been forcibly removed from their families and communities since the very first days of the European occupation of Australia. In that time, not one Indigenous family has escaped the effects. Most families have been affected in one or more generations by the removal of one or more children. Nationally, the Inquiry concludes that between one in three and one in ten Indigenous children were forcibly removed from their families and communities between 1910 and 1970. The National Inquiry was established by the federal Attorney General in 1995. It was conducted by the Human Rights and Equal Opportunity Commission (now known as the Australian Human Rights Commission). The Inquiry visited every state and territory capital and most regions of Australia, from Cape Barren Island in the south to the Torres Strait and the Kimberley in the north. Limited resources meant the Inquiry could not travel to every centre. The Inquiry took evidence in public and private sittings from Indigenous people, government and church representatives, former mission staff, foster and adoptive parents, doctors and health professionals, academics, police and others. People also made written submissions. Most hearings were conducted by former Commission President, Sir Ronald Wilson, and the former Aboriginal and Torres Strait Islander Social Justice Commissioner, Mick Dodson. In each region an Indigenous Commissioner was appointed to assist with the hearings. An Indigenous Advisory Council, with representatives from every major region, also assisted the Inquiry. This time line provides a brief outline of the laws, practices and policies of forcible removal and some of the context in which they were developed (until the Inquiry was submitted in 1997). Rock engravings in South Australia suggest evidence of land inhabitancy. Dutch explorers record the journeys of Macassan Trepangers (Indigenous traders from Indonesia) to northern Australia. Trade between the Macassans and Aborigines continues until 1906. James Cook claims possession of the whole east coast of Australia. Cook raises the British flag at Possession Island, off Cape York Peninsula in Queensland. The First Fleet lands in Port Jackson - British settlement in Australia begins. Clashes between Aboriginal people and the settlers are reported over the next 10 years in the Parramatta and Hawkesbury areas. Governor Macquarie opens a school for Aboriginal children at Parramatta called the 'Native Institution'. Tasmanian Aboriginal people are resettled on Flinders Island without success. Later, the community is moved to Cape Barren Island. British Select Committee examines the treatment of indigenous peoples in all British colonies and recommends that 'Protectors of Aborigines' be appointed in Australia. Myall Creek Massacre: Near Inverell (NSW), settlers shoot 28 Aboriginal people, mostly women and children. 11 Europeans were charged with murder but are acquitted. A new trial is held and seven men are charged with the murder of one Aboriginal child. They are found guilty and hanged. The Aborigines Protection Act (Vic) establishes an Aborigines Protection Board in Victoria to manage the interests of Aborigines. The Governor can order the removal of any Aboriginal child from their family to a reformatory or industrial school. The NSW Aborigines Protection Board is established to manage the lives of 9,000 people. The Aboriginal Protection and Restriction of the Sale of Opium Act (Qld) allows the Chief Protector to remove local Aboriginal people onto and between reserves and hold children in dormitories. Until 1965 the Director of Native Welfare is the legal guardian of all aboriginal children whether their parents are living or not. Australia becomes a Federation. The Constitution states that Aboriginal People will not be counted in the census, and that the Commonwealth has the power to make laws relating to any race of people in Australia with the exception of Aborigines. The federated states therefore retain exclusive power over Aboriginal affairs until the Constitution is amended in 1967. The Aborigines Act (WA) is passed. Under this law, the Chief Protector is made the legal guardian of every Aboriginal and 'half-caste' child under 16 years old. In the following years, other states and territories enact similar laws. The Aborigines Protection Act (NSW) gives the Aborigines Protection Board power ‘to assume full control and custody of the child of Aborigine’ if a court found the child to be neglected under the Neglected Children and Juvenile Offenders Act 1905 (NSW). The Aborigines Act (SA) makes the Chief Protector the legal guardian of every Aboriginal and `half-caste' child with additional wide-ranging powers to remove Indigenous people to and from reserves. The Northern Territory Aboriginals Ordinance (Cth) gives the Chief Protector powers to assume `the care, custody or control of any Aboriginal or half caste if in his opinion it is necessary or desirable in the interests of the Aboriginal or half caste for him to do so'. The Aborigines Ordinance 1918 (Cth) extends the Chief Protector’s control even further. Coniston Massacre, Northern Territory. Europeans shoot 32 Aborigines after a white dingo trapper and station owner are attacked by Aboriginals. A court of inquiry says the European’s action was ‘justified'. The Infants Welfare Act (Tas) is used to remove Indigenous children on Cape Barren Island from their families. From 1928 until 1980 the head teacher on Cape Barren is appointed as a special constable with the powers and responsibilities of a police constable, including the power to remove a child for neglect under child welfare legislation. The first Commonwealth / State conference on 'native welfare' adopts assimilation as the national policy: The destiny of the natives of aboriginal origin, but not of the full blood, lies in ultimate absorption … with a view to their taking their place in the white community on an equal footing with the whites. In 1951, at the third Commonwealth / State Conference on 'native welfare', assimilation is affirmed as the aim of 'native welfare' measures. Australian Aborigines Conference held in Sydney. Meeting on January 26, the 150th Anniversary of NSW, Aborigines mark the 'Day of Mourning'. The Universal Declaration of Human Rights is adopted by the newly-formed United Nations, and supported by Australia. The Convention on the Prevention and Punishment of the Crime of Genocide is ratified by Australia. It comes into force in 1951. A national referendum is held to amend the Constitution. Australians confer power on the Commonwealth to make laws for Aboriginal people. Aborigines are included in the census for the first time. By 1969, all states had repealed the legislation allowing for the removal of Aboriginal children under the policy of ‘protection’. In the following years, Aboriginal and Islander Child Care Agencies (“AICCAs”) are set up to contest removal applications and provide alternatives to the removal of Indigenous children from their families. The Commonwealth Government passes the Racial Discrimination Act 1975. The Aboriginal Land Rights (Northern Territory) Act is passed by Commonwealth Parliament in 1976. It provides recognition of Aboriginal land ownership, granting land rights to 11,000 Aboriginal people and enabling other Aboriginal people to lodge a claim for recognition of traditional ownership of their lands. Link-Up (NSW) Aboriginal Corporation is established. It is followed by Link-Up (Brisbane) in 1984, Link-Up (Darwin) in 1989, Link-Up (Tas) in 1991, Link-Up (Vic) in 1992, Link-Up (SA) in 1999, Link-Up (Alice Springs) in 2000, and Link-Up (WA- seven sites) in 2001. Link-Up provides family tracing, reunion and support for forcibly removed children and their families. Secretariat of the National Aboriginal and Islander Child Care (SNAICC) established. SNAICC represents the interests on a national level of Australia's 100 or so Indigenous community-controlled children's service organisations. 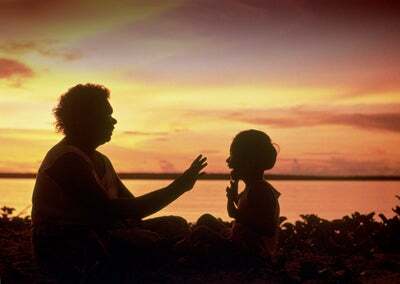 The Aboriginal Child Placement Principle, developed principally due to the efforts of Aboriginal and Islander Child Care Agencies (“AICCAs”) during the 1970s, is incorporated in NT welfare legislation to ensure that Indigenous children are placed with Indigenous families when adoption or fostering is necessary. This is followed in NSW (1987), Victoria (1989), South Australia (1993), Queensland and the ACT (1999), Tasmania (2000) and Western Australia (2006). Northern Territory elections are held and for the first time voting is compulsory for Aboriginal people. The Bicentennial of British Settlement in Australia takes place. Thousands of Indigenous people and supporters march through the streets of Sydney to celebrate cultural and physical survival. The Council for Aboriginal Reconciliation is set up, funded by the Commonwealth Government. Parliament noted that there had not been a formal process of reconciliation to date, 'and that it was most desirable that there be such a reconciliation’ by 2001. The Royal Commission into Aboriginal Deaths in Custody presents its report to the Commonwealth Government. It finds that of the 99 deaths it investigated, 43 were of people who were separated from their families as children. The High Court of Australia hands down its landmark decision in Mabo v Queensland. It decides that native title exists over particular kinds of lands – unalienated Crown Lands, national parks and reserves - and that Australia was never terra nullius or empty land. The Commonwealth Government passes the Native Title Act 1993. This law allows Indigenous people to make land claims under certain situations. Claims cannot be made on freehold land (privately-owned land). The position of Aboriginal and Torres Strait Islander Social Justice Commissioner is established within the Human Rights and Equal Opportunity Commission (HREOC). The Commissioner's role is to monitor and report to the Commonwealth Parliament on the human rights of Indigenous Australians. The Going Home Conference in Darwin brings together over 600 Aboriginal people removed as children to discuss common goals of access to archives, compensation, rights to land and social justice. The National Inquiry into the Separation of Aboriginal and Torres Strait Islander Children from Their Families is established by the Commonwealth Government in response to efforts made by key Indigenous agencies and communities. The High Court hands down its decision in the Wik Case concerning land which is, or has been, subject to pastoral leases. HREOC presents Bringing them home, its report on the findings of the National Inquiry into the Separation of Aboriginal and Torres Strait Islander Children from Their Families, to the Commonwealth Government. Children could be put into an institution or mission dormitory, fostered or adopted. Many children were fostered or adopted after spending time in a children’s home. Many spent time in more than one institution or foster family. Later many were sent out to work. Some moved from institution or foster family to detention centre or psychiatric hospital. More than half (56%) the people who gave evidence to the Inquiry had experienced multiple placements following their removal. The Inquiry found ‘assimilation’ was rigorously pursued by most authorities and by non-Indigenous foster and adoptive families. In particular, children and their families were discouraged or prevented from contacting each other. One of the girls was doing Matron’s office, and there was all these letters that the girls had written back to the parents and family — the answers were all in the garbage bin. And they were wondering why we didn’t write. That was one way they stopped us keeping in contact with our families. Then they had the hide to turn around and say, ‘They don’t love you. They don’t care about you’. When my mum passed away I went to her funeral, which is stupid because I’m allowed to go see her at her funeral but I couldn’t have that when she requested me. They wouldn’t let me have her. The Inquiry found that many children were told they were unwanted, rejected or their parents were dead, when this was not true. I remember this woman saying to me, ‘Your mother’s dead, you’ve got no mother now. That’s why you’re here with us’. Then about two years after that my mother and my mother’s sister came to The Bungalow but they weren’t allowed to visit us because they were black. The Inquiry found many witnesses were taught to feel contempt for Aborigines. Those who knew their own heritage transferred that contempt to themselves. We were told that our mother was an alcoholic and that she was a prostitute and she didn’t care about us. They used to warn us that when we got older we’d have to watch it because we’d turn into sluts and alcoholics, so we had to be very careful. If you were white you didn’t have that dirtiness in you ... It was in our breed, in us to be like that. I didn’t know any Aboriginal people at all, none at all. I was placed in a white family and I was just — I was white. I never knew, I never accepted myself to being a black person until — I don’t know if you ever really do accept yourself as being ... How can you be proud of being Aboriginal after all the humiliation and the anger and the hatred you have? It’s unbelievable how much you can hold inside. The Inquiry found that the conditions of missions, government institutions and children’s homes were often very poor. Resources were insufficient to improve them, or keep children properly clothed, fed and sheltered. There was no food, nothing. We was all huddled up in a room like a little puppy dog on the floor. Sometimes at night we’d cry with hunger. We had to scrounge in the town dump, eating old bread, smashing tomato sauce bottles, licking them. Half of the time the food we got was from the rubbish dump. Institutional regimes were often very strict, with severe punishments for breaking the rules. The Inquiry found that the education provided in Indigenous children’s institutions was essentially a preparation for menial labour. However, the promise of a good education was often the inducement for parents to relinquish their children to the authorities. I don’t know who decided to educate the Aboriginal people but the standard was low in those mission areas. I started school at the age of eight at grade one, no pre-school. I attended school for six years, the sixth year we attended grade 4, then after that we left school, probably 14 years old. I wanted to be a nurse, only to be told that I was nothing but an immoral black lubra, and I was only fit to work on cattle and sheep properties. The Inquiry found that children placed in work by the authorities were not entitled or trusted to receive their wages. These were supposed to be held in trust, but many never received the money that was rightfully theirs. We never, ever got our wages. It was banked for us. And when we were 21 we were supposed to get this money. We never got any of that money ever. And that’s what I wonder: where could that money have went? Or why didn’t we get it? Many witnesses told the Inquiry of being physically assaulted and brutally punished in placements. These children were most at risk of this treatment in foster or adoptive families. Almost a quarter (23.4%) of witnesses to the Inquiry who were fostered or adopted reported being assaulted there. One in six children who were institutionalised reported physical assault and punishments. WA Chief Protector, A.O. Neville found it necessary to ban ‘degrading and injurious punishments and the practice of holding inmates up to ridicule, such as dressing them in old sacks or shaving girls’ heads’. A NSW superintendent was told ‘that on no account must he tie a boy up to a fence or tree, that such instruments as lengths of hosepipe or a stockwhip must not be used, that no dietary punishments shall be inflicted’. Dormitory life was like living in hell. It was not a life. The only things that sort of come out of it was how to work, how to be clean, you know and hygiene. That sort of thing. But we got a lot of bashings. Sexual abuse was reported to the Inquiry by one in five people who were fostered and one in ten people who were institutionalised. One in ten alleged they were sexually abused in a work placement organised by the Protection Board or institution. There was tampering with the boys ... the people who would come in to work with the children, they would grab the boys’ penises, play around with them and kiss them and things like this. These were the things that were done ... It was seen to be the white man’s way of lookin’ after you. It never happened with an Aboriginal. I ran away because my foster father used to tamper with me and I’d just had enough. I went to the police but they didn’t believe me. So she [foster mother] just thought I was a wild child and she put me in one of those hostels and none of them believed me — I was the liar. So I’ve never talked about it to anyone. I don’t go about telling lies, especially big lies like that. The Inquiry found that welfare officials failed in their duty to protect Indigenous wards from these abuses, often in the very placements they had organised. My sister saw our welfare officer when she was grown up and he told her that he’d always thought our [foster] house was abnormal. He thought us kids were abnormal. He thought we were like robots, we had to look at her before we said anything. When an officer comes along they’re supposed to talk to you on your own. Our foster mother insisted that she had to be in the room because they could sexually assault us while she was out of the room, so she wasn’t going to allow it. Being the minister’s wife, they agreed that she was allowed to sit there. So we never had the chance to complain. Welfare never gave us a chance. Some witnesses to the Inquiry spoke of finding affection and happiness in their adoptive family or, more rarely, in a children’s home. The Inquiry found that the bonds permitted in these more enlightened placements went some way to overcoming the many other damaging effects for Indigenous children. We were all happy together, us kids. We had two very wonderful old ladies that looked after us. It [Colebrook, South Australia] wasn’t like an institution really. It was just a big happy family. Y’know they gave us good teaching, they encouraged us to be no different to anybody else. The Inquiry found people have many reasons why they need to trace their families. Reunion is important at the very least for discovering information about health and inherited illnesses and for developing intimate relationships. The Inquiry was told many separated children will never go home. The pathways have been lost; parents and families have died. Language barriers can inhibit reunions. People whose Aboriginality was denigrated in childhood may not want to admit to it. Those who do go home experience a variety of emotions including anxiety and fear. I’ve seen the old lady four times in my life. She’s 86 years old. We were sitting on the bench [the first time]. I said, ‘I’m your son’. ‘Oh’, she said, and her eyes just sparkled. Then a second later she said, ‘You’re not my son’. Well mate, the blinking pain. Didn’t recognise me. The last time she saw me I was three years old. I went to Link-Up who found my family had all died except one sister. I was lucky enough to spend two weeks with her before she died. She told me how my family fretted and cried when I was taken away. They also never gave up hope of seeing me again. The Inquiry was told some reunions are unsupported, with inadequate preparation or counselling for either party. Some witnesses spoke of rejection by the community. I’ve received a lot of hostility from other Aboriginal people. They’re my own relatives and they really hurt me because ... they have a go at me and say that I don’t even know my own relatives, and that I should; that I’ve got nothing in common with them. The damage is all done and I can’t seem to get close to any of them. Some witnesses returned to families still grieving their loss and awaiting their return. It was this kind of instant recognition. I looked like her, you know? It was really nice. She just kind of ran up to me and threw her arms around me and gave me a hug and that was really nice. And then suddenly there was all these brothers coming out of the woodwork. I didn’t know I had any siblings. And uncles and aunts and cousins. Suddenly everyone was coming around to meet me. When I was 20 years old I was reunited with my mother for the first time shortly before she died. I suppose I had a natural curiosity to meet and know her. I had an urge to see my mother and when I met her she said, ‘I knew you’d come’. I didn’t know at this stage I was Aboriginal. My mother was the first Tasmanian Aboriginal person I had met. A few of my natural siblings were with her. I still haven’t met some of my natural siblings. The Inquiry found that an unknown number of Indigenous children were taken overseas by foster or adoptive families. For them, locating family and re-establishing links are particularly difficult, if not impossible. The importance of doing so is likely to be as great for them as for people living in Australia. funding Indigenous mental health programs dealing with grief and loss, parenting and families, and the other effects of forcible removal. church records are hard to access. The Inquiry recommended the process of accessing personal and family records should be easier and more straightforward. There should be a Family Information Service in every state and territory for Aboriginal and Torres Strait Island people. The guidelines for access should be developed by a state or territory taskforce with government, church and Indigenous agency representatives. The Inquiry found that many people need counselling when they read their files. The Inquiry recommended Indigenous community-based family tracing and reunion services be established in each region and funded to meet all the needs of clients for as long as they need it. There are a lot of untrue things about me on those files. I have cried about the lies on those files. There’s letters written there in my handwriting and I go berserk, I can’t handle it. I can’t go near them because I see my handwritten letters there as a little kid. You know, ‘May I see my brothers and sisters? I haven’t seen them for a long time. They’re dear to my heart’. ‘Do you know where my mum is? Can I please see my dad?’ There’s letters written back by them that my behaviour didn’t warrant visits. There’s letters there saying that if I didn’t improve my behaviour that I would not be able to be with my brothers and sisters and that I would never see my parents again. The Inquiry recommended that counselling and support should be made available through Indigenous family tracing and reunion services. too many Indigenous people end up in mental hospitals or prison. Prevention and intervention are required. The Inquiry recommended the focus should change from the individual who seems to be suffering mental illnesses to the needs of the whole community. Funding should go to community based prevention services that take a holistic view of health and a cultural perspective on health and well-being of the whole family and community. Where specialists are needed they should work in partnership with Indigenous healers. The Inquiry recommended that all those who work with Indigenous people - doctors, police, judges, magistrates, social workers – be properly trained. Their training must include information about the history of forcible removal and the effects of forcible removal on children, families and communities. This is a prerequisite for the provision of good services to Indigenous communities. Family tracing and reunion services and Aboriginal and Islander Child Care Agencies are appropriate organisations to provide this training. The Inquiry recommended that these services employ Indigenous people. Indigenous people should be trained and culturally appropriate Indigenous trainers should be employed. Scholarships and traineeships should be set up by governments for Indigenous people to become healers, health workers, genealogists, archivists, researchers and counsellors. The Inquiry found churches played a major role in forcible removals by providing accommodation and other services to the children in line with government policy. With hindsight, we recognise that our provision of services enabled these policies to be implemented. We sincerely and deeply regret any hurt, however unwittingly caused, to any child in our care. — The Daughters of Our Lady of the Sacred Heart Australian Province. returning mission and institution land to Indigenous people. Lots of white kids do get taken away, but that’s for a reason — not like us. We just got taken away because we was black kids, I suppose — half-caste kids. If they wouldn’t like it, they shouldn’t do it to Aboriginal families. Australia, as a member of the United Nations from 1945, committed itself to abolish racial discrimination. The Inquiry found that by the early 1950s, the international prohibition of racial discrimination of the kind to which Indigenous families and children were subjected was well-recognised, even in Australia. The Inquiry concluded that forcible removal was an act of genocide contrary to the Convention on Genocide ratified by Australia in 1949. The Convention on Genocide specifically includes ‘forcibly transferring children of [a] group to another group’ with the intention of destroying the group. Genocide is not only the mass killing of a people. The essence of genocide is acting with the intention to destroy the group, not the extent to which that intention has been achieved. A major intention of forcibly removing Indigenous children was to ‘absorb’, ‘merge’ or ‘assimilate’ them, so Aborigines as a distinct group would disappear. Authorities sincerely believed assimilation would be in the ‘best interests’ of the children, but this is irrelevant to a finding that their actions were genocidal. The Inquiry concluded that even before international human rights law developed in the 1940s the treatment of Indigenous people breached Australian legal standards. Indigenous families were entitled to expect the protection of the British common law imported into Australia. Two relevant legal principles were denied on racial grounds to Indigenous families. These principles grew from the common law’s respect for personal and family liberty and parental rights. The first was that children should not be removed from their parents unless a court makes that decision. The court order must be based on evidence proving removal is in the best interests of the child. The second principle was that parents are the legal guardians of their children unless a court orders otherwise in the interests of the child. The legal guardian has the right to decide where the children will live and how they will be educated and raised. In WA (1905-1954), NT (1911-1964), NSW (1915-1940), SA (1911-1923) and Queensland (1897-1965) Indigenous children could be taken without a court order. But Australian law applying to non-Indigenous families required a court finding of ‘neglect’, ‘destitution’ or ‘uncontrollability’ before a child could be removed into State care. In WA, SA, NT and Queensland most Indigenous parents lost their guardianship rights because the law made the Protector or Protection Board the legal guardian of their children. But under British and Australian law, non-Indigenous parents were the full guardians of their children unless a court transferred guardianship to the State. The Inquiry found that many forcibly removed children had harrowing experiences in mission dormitories, childrens homes, group homes and foster families. Many were denied proper care and education, contrary to the legal responsibilities of the authorities at the time. The Inquiry concluded that, by causing harm and allowing the children to be harmed and abused, the Protection Board or Native Welfare breached its legal duty to look after them properly. And for them to say Mum neglected us! I was neglected when I was in this government joint down here. I didn’t end up 15 days in a hospital bed when I was with me Mum and Dad. The Inquiry concluded forcible removal involved human rights breaches and the denial of common law protections to Indigenous families and children. Governments have a responsibility to respond with ‘reparation’ to those affected. The Government has to explain why it happened. What was the intention? I have to know why I was taken. I have to know why I was given the life I was given and why I’m scarred today. Why was my Mum meant to suffer? Why was I made to suffer with no Aboriginality and no identity, no culture? Why did they think that the life they gave me was better than the one my Mum would give me? And an apology is important because I’ve never been apologised to. My mother’s never been apologised to, not once, and I would like to be apologised to. Thirdly, I’ve been a victim and I’ve suffered and I’ll suffer until the day I die for what I’ve never had and what I can never have. I just have to get on with my life but compensation would help. It doesn’t take the pain away. It doesn’t take the suffering away. It doesn’t take the memories away. It doesn’t bring my mother back. But it has to be recognised. And I shouldn’t forget counselling. I’ve had to counsel myself all my life from a very young age. And in the homes I never showed my tears ... I’ve been told that I need to talk about my childhood. I need to be counselled for me to get on with my life. The Inquiry determined everyone affected by forcible removals should be entitled to reparation. Those affected include the children who were forcibly removed, their families, communities, children and grandchildren. Australian governments should ensure the adequate funding of appropriate Indigenous agencies to record, preserve and administer access to the testimonies of people affected by forcible removal, who wish to provide their histories in written, audio or audio-visual form. Australian parliaments, police forces and churches should acknowledge their responsibility and apologise to everyone affected by forcible removal. There should be a national Sorry Day for the children and their families and ATSIC should coordinate other commemorations in local and regional areas. Everybody — including primary and secondary school children, judges, doctors, police and other decision-makers — should be told about the history of forcible removal and the continuing effects on families, communities and the next generation. Language, culture and history centres should be established in each region to teach the separated children and their descendants their language and to teach the history to everyone. Indigenous organisations which help people find their families should be able to certify a person is of Aboriginal or Torres Strait Islander descent and is accepted as Aboriginal or Torres Strait Islander by the organisation. A person who was a forcibly removed child should get a lump sum amount for compensation unless the removal was justifiable. should be set up to administer the fund, made up of Indigenous and non-Indigenous people and chaired by an Indigenous person. The Board should not be legalistic or formal, but culturally appropriate and accessible to all Indigenous people. The Inquiry found that entrenched disadvantage and dispossession mean the removal of Indigenous children continues today. Indigenous children are six times more likely to be removed for child welfare reasons and 21 times more likely for juvenile justice detention, than non-Indigenous children. In child welfare, Indigenous children are more likely than non- Indigenous children to be removed on the ground of ‘neglect’ rather than ‘abuse’. Often Indigenous parenting styles are wrongly seen as the cause. The Inquiry found that there are many reasons for the continuing high removal rates of Indigenous children. Indigenous young people come into conflict with the law due to policing and the administration of justice. Indigenous families and communities live in poverty, are provided with inadequate and usually inappropriate services and do not have decision-making power about the services they receive, particularly about how children and young people are dealt with. The Inquiry found that Indigenous young people who come into contact with the child welfare system are more likely to come into contact with the juvenile justice system. Those who do often don’t receive equal treatment before the law. Indigenous young people generally receive harsher sentences than non-Indigenous youth, particularly when being sentenced to detention. Commissioner to draft legislation setting out a framework for negotiating regional or local agreements on self-determination about children and families. The Inquiry found that some communities may want control of the child welfare and juvenile justice systems themselves — the transfer of legal powers should be possible. Other communities may want to share powers with the state or territory. Others may want organisations or community councils to make certain decisions. Yet others may want to be responsible for community-based sentences for juvenile offenders. The range of choices is wide and every community should be assisted to choose what is right for itself. The Inquiry recommended that the social justice recommendations of the Royal Commission into Aboriginal Deaths in Custody should be implemented and the Commonwealth Government should adopt a social justice package for children and families. Accredited Indigenous organisations should play a major role in setting and implementing minimum standards and rules. The process for accrediting organisations will also need to be negotiated. These ‘standards’ and ‘rules’ are reproduced in detail under Recommendations.